Adding Custom Audiences for your Facebook ad campaigns is a great tool for getting in front of your existing customers with an additional marketing platform. Basically, it’s a way you can target your own mailing list or phone list through Facebook. And on top of that, you can create additional audience’s that are similar based on the list created. Pretty cool, huh? I like to work from Power Editor which is only available in the Chrome Browser. So, the first step is to get to the Power Editor in Facebook. Simply login in to your Facebook account using Chrome. 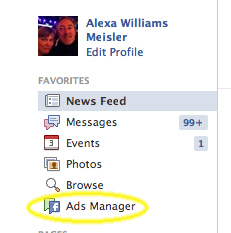 Once you are logged in to your Facebook account click on the home button in the upper right corner of your page and then click on the ads manager. Next, simply click on Power Editor. From here you’ll want to upload your opted-in mailing list, customer phone numbers or even Facebook id’s. Simply click on Create Audience and from the drop down choose Custom Audience. You’ll be able to upload directly from Mailchimp or from a text or excel file as well as from a mobile app. You can upload a set of e-mail addresses, phone numbers, Facebook User IDs, or App User Ids. The file must be in .csv or .txt format with only the e-mails listed (or other form of data you are matching with – phone numbers, etc). The data you uploaded is then matched with Facebook user data. This means that not 100% of your data will be a match for the info used when the user created their Facebook. Let’s say someone has multiple emails. You may have been given a different email than they used to create their Facebook account and it won’t necessarily be a match. Once the audience is uploaded, which can take a few hours you are ready to add a new way to leverage your client database, email marketing list or other information you have such as client phone numbers. Using this honed in ad targeting to reach your clients in conjunction with an email blast and other social platforms is a great way to stay visible with your clients and allow them to see all the great things you are up to and valuable information you have to share. So, you’ve set up your Custom Audience’s. Now what? Promote a post, create an ad or drive more people to your website with you new custom audiences. But, make sure to do it by sharing information that will be valuable to your clients (meaning that it is worthy of a comment or a like)! 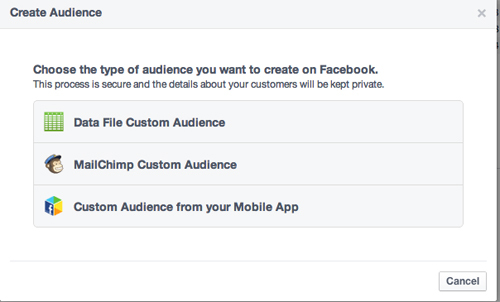 Remember: you must have permission to use this data as stated in Facebook’s Custom Audience terms. Check back soon as next we’ll look into Similar Audience targeting. This is a great tool to find similar people to target based on your current saved custom audiences! This entry was posted in SMM, Social Media, Web Development, ZD White Wall and tagged facebook, SMM, social media, social media audience, social media marketing. Subscribe to our mailing list to stay up to date with online marketing. How to use facebook ads to reach your audience.